Lung Yun (Long Yun) was the corrupt and independent-minded governor of Yunnan, who had come to power in 1927 and was the last of the great warlords. He had a reputation for ruthlessness but offered minimal resistance to the Chinese Communists during the Long March. 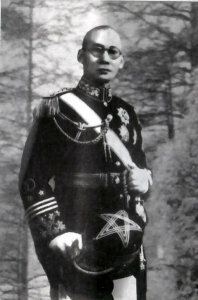 Chiang Kai-shek was reluctant to allow Y Force to advance into Burma from Yunnan in part because its presence was a check on Lung's independence. Lung aided the escape of Wang Ching-wei to Hanoi. Wang later became the head of the Nanking collaborationist government. Chiang never forgave Lung for this. British sources (e.g. Allen 1984) claim Lung was in regular contact with Okamura Yasutsuga, commander of China Expeditionary Army. Kunming, Yun's power base, was the location of Southwest Associated University, which provided much of the intellectual leadership of the Democratic League. The Democratic League was active in anti-Chiang activities. Lung refused to transfer the sales tax to Chungking and diverted a significant amount of American aid coming through the Himalayas airlift to his own use. He also set up several banks in opposition to the central government banking system, which printed their own currency, and established a trading company to control the local economy. Late in the war, Tu Yu-ming staged a coup on Chiang's instructions to remove Lung from power.